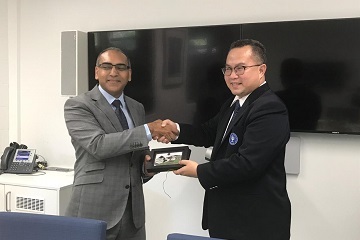 During a series of visits to strategic partners in Australia, the Rector of IPB, Dr. Arif Satria, had the opportunity to present the Agro-maritime 4.0 Agenda at the Boarding Forum Australia Indonesia Center (AIC), Clayton Campus, Monash University, (7/2). The forum involved scientists, Indonesian from Monash University, business practitioners and the media who attended the meeting. In his presentation, Dr. Arif Satria emphasized the importance of IPB to prepare graduate students to be adaptive and in accordance with the changes that occur related to future skills needs (future skills). So that they will be ready to be able to participate in the process of re-skilling and up-skilling during their careers both as techno and socio-preneur or other professions that are qualified. The Rector of IPB also conveyed the need of rapid adaptation in addressing the dynamics of change. "Technology in this case plays an important role. Therefore, human resources are the key to success, "said the Chancellor. During a visit at Monash University, the Rector of IPB also met with Vice President Prof. Abid Khan and Director of AIC, Dr. Eugene Sebastian to discuss the continuation of the second phase of the AIC consortium's research collaboration entering the research with impact phase (2019-2022) in which seven state universities of legal entities (PTNBH) and four universities in Australia will be involved by taking research locations as learning sites outside Java . This interdisciplinary research will answer various current problem areas related to food, water, infrastructure, transport, logistics and health in the eastern part of Indonesia. This collaboration will involve various parties, including universities, government, private sector and the community. Furthermore, the expansion of cooperation was also discussed with the Monash University Faculty of Economics and Business as a follow-up to the visit of the Dean of the Faculty of Economics and Management (FEM) of IPB in October 2018 specifically for the preparation of a double degree management and global business program (Faculty of Economics and Business) for undergraduate programs and S2. Student mobility between two institutions becomes an agenda which will also be followed up soon. In addition, Monash University is also preparing a new multidisciplinary master's program in the field of food and agribusiness. This program will involve Monash University's "Food Innovation Center" facilities which will directly bring the business world closer to campus through its researches with various modern facilities. IPB will be able to cooperate in the degree program.